We will keep tasting Wine of Moldova for the time being, and we’ve decided to go back to cabernet sauvignon theme. 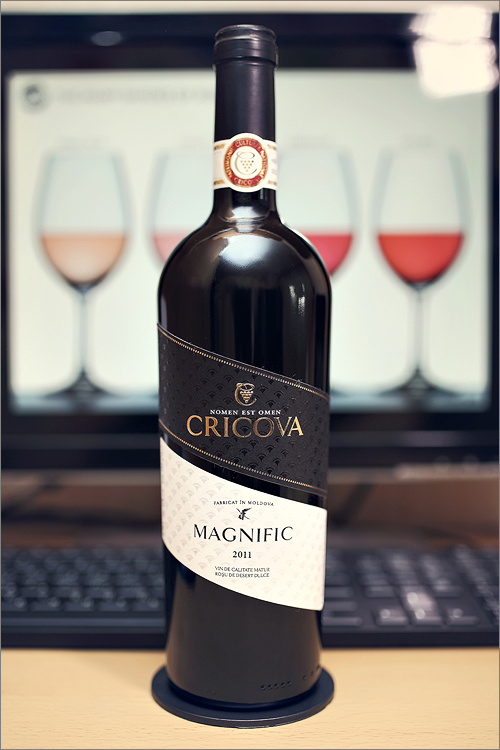 And there is a reason why – the wine we are going to review tonight is not a regular cabernet sauvignon wine, mind you, it is the absolute opposite of that – a sweet, fortified, dessert red wine, made in a nontraditional way – Magnific 2011 from Cricova. The wine has a deep and opaque purple color, with the rim-color of clear purple shade. The nose is strong with no signs of wine faults. The first nose cuts deep into the senses and it brings sharp notes of fruit jam and ethanol: sour cherry, candied sour cherry, red plum jam, sweet cherry jam, red currant, black mulberry jam, black raspberry and red apple. Then comes the dominant secondary notes of wormwood, rubber, burnt sugar, black tea, cinnamon and roasted wood. The wine is extra sweet with quite a lot of residual sugar and added grape syrup. It has strong, poorly integrated alcohol level, light acidity and soft tannin. This is a sweet, but harsh and concentrated, wine: sharp, aggressive and jammy. The wine has a fair overall balance, it feels angular, austere and a bit opulent on the palate. The wine has a long finish and a balanced aftertaste. It is sweet and strong, with a nuanced astringency towards the end, which leaves a burning feeling in the back of the mouth. This is definitely a good Wine of Moldova and the overall rating says the same, with 84.7 points scored it is right there, among the best wines we’ve tasted so far. Please click on the chart icon on the left in order to get to the wine rating page, where you can find all the wines we’ve tasted to date. Last but not least, we would like to mention that this is a quite appealing dessert wine overall, one that can satisfy the taste of a wide range of consumers, and, which is more important, a wine style that is quite on the demand here in Moldova. In fact, the most popular wines for winter holidays and Easter are non other than those fortified/dessert red wines, known commonly as Kagor, which in fact is a misleading name, as those wines has naught in common with the dry, inky-purple wines, made of malbec grapes, from the Cahors region in France. But this is a different story for a different time.